These days’ businesses and homeowners are looking for ways to save money while shopping for the best tools. More and more homeowners are trying to save money buy doing their own repairs at home. This includes any plumbing problems that they may have. 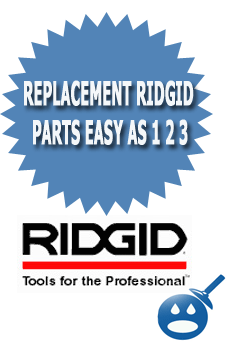 So why not have the best equipment possible, at RIDGID they have all of the tools that you will need for any home improvement job at reasonable prices. One of the biggest problems for homeowners is clogged drains. Drains clogged with so much debris that the store bought drain cleaners won’t clear up. So rather than spend hundreds of dollars per hour on a company that can’t make it right away, why not invest in RIDGID Sectional Machines. 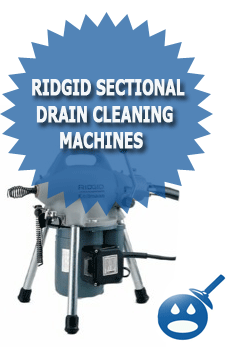 RIDGID has a full line of Sectional Machines that can help with any drain problem you may have. RIDGID’s line of Sectional Machines are available in Model K-50, K-60, K-75 and the K-1500 Series. Let’s see what each machine has to offer. The RIDGID K-50 Sectional Machine is a small but powerful machine. It has the capacity to run with three different size cables. The one of a kind design makes the K-50 easy to handle, its design utilizes an instantaneous acting clutch that helps the user take more control of the machine. It comes with a pull handle for the cable and the cable can spin at an outstanding 400 rotations per minute. The K-50 is perfect to use on sinks, showers, baths and floor drains. The K-50 can be used with 5/16″, 3/8″ and 5/8″ cable. The machine was designed to clean and unclog 4-inch lines up to 100 feet. The K-50 Model C-8 works best on 3″ drains and the C-9 works best on 2 inch to 4 inch lines. Each machine comes with a 1/6 horsepower motor and it runs on 115-volt power supply. Each machine comes with an adapter, which can run about 50 feet of the 5/16″ cable or 35 feet of 3/8″ of cable. When you purchase the K-50 you will receive the K-50 Sectional Machine, an A-17 Adapter that comes with a 25 foot X 5/16″ Auger Cable. The K-50 comes with an A-17-B Adapter that comes with a 35 foot x 3/8″ Auger Cable. The RIDGID K-50 Sectional Machine comes with a Full Lifetime Warranty. The RIDGID K-60 Sectional Machine is best used for commercial and residential cleanings. The K-60 has been most effective on septic tanks as well. The unit is compact and is easy to transport as well as fits well on any jobsite. The K-60 has even been known to be used on rooftop vent stacks. Like the K-50, this machine is easy to handle and has a fast acting cable clutch, which helps the user gain better control of the machine. The RIDGID K-60 is equipped with very easy to make adjustment handles that can spin two sizes of cable, the 7/8″ and the 5/8″. The machine will make the necessary adjustments in just a matter of seconds. The 7/8″ cable works best on lines 2″ to 4″ and about 150 feet. The 5/8″ cable will clean lines 1-1/4″ to 4″, which will run about 125 feet. There are two bolts that come off to gain access the jaw set for either cleaning or even for replacements. When you purchase a RIDGID K-60 SP-SE Sectional Machine you will receive the K-60SP Machine. You will also receive an Operator’s Mitt and a Rear Guide Hose. The kit also includes a Cable Kit that includes a cable carrier with 5 sections of 7/8″ cable with a length of 75 feet. The K-60 comes with a Tool Kit includes a Straight Auger, Funnel Auger, Spade Cutter, Retrieving Auger, Sharktooth Cutter, Pin Key and Tool Box. The RIDGID K-60 Sectional Machine comes with everything you need and more. 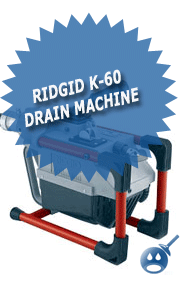 The RIDGID K-75 Sectional Machine was designed to handle drain lines from 1-1/4″ to 4 inches. The K-75 is a lightweight designed sectional machine that can help unclog a drain line in a matter of minutes. The K-75 has a pull down handle, which has cable spinning of 640 rpms. It has an easy to release handle that will free up the cable in seconds. The RIDGID K-75 comes with an easy to turn handle that works with a 15-foot section of 7/8″ of cable. 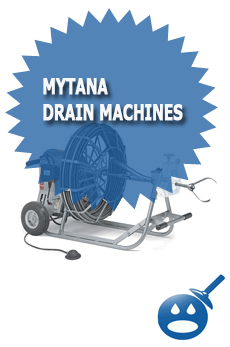 It is able to clean drain lines from 2″ to 4″ with a cable length of 175 feet. The RIDGID K-75 comes with a change clutch jaw that can work with 7-1/2 foot sections. It comes with a 1/2 horsepower motor and it is available with upright and low profile frame styles. This machine is CSA approved and works great for any application. When you purchase the RIDGID K-75B-SE, you will get the K-75B Sectional Machine. The machine comes with a Mitt, Pin Key and Rear Guide Hose. The K-75 Sectional Machine comes with a Cable Kit that includes 5 sections of 7/8″ cable with a 75-foot of cable. The Tool Kit comes with a Straight Auger, Funnel Auger, Spade Cutter, Retrieving Auger, Sharktooth Cutter, a Tool Box and a Pin Key. This complete kit makes a great addition to any business or home toolbox. The RIDGID K-1500 Series Sectional Machine is one of the premier drain cleaning machines in the RIDGID Line. This machine is designed so that one person can operate it. This machine can withstand even the hardest clogs, the K-1500 Series can unclog drain lines from 2″ to 8″. This machine has a pull down handle with the cable spinning at 710 rpms. This machine is easy to set up and works fast too. The RIDGID K-1500 is a low profile machine. The frame will fit in most crawl spaces and it is easy to transport. The 1500 Series comes with 15-foot sections of 1-1/4 cable which works perfectly for 3″ to 8″ drain lines. The K-1500 Series has 3/4 horsepower and a 115 volt. When you get the K-1500 B W/C-11 you will receive the K-1500 B Machine. The K-1500 comes with a Mitt, Pin and a Rear Guide Hose. This machine has 7 sections of 1-1/4 Cable with a length of 105 feet. The K-1500 Series Sectional machine comes with a Straight Auger, Funnel Auger, Retrieving Auger, Hex Key, Sawtooth Cutter, Sharktooth Cutter, Grease Cutter and a Tool Box. The RIDGID K-1500SP Sectional Machine that works best with 2 inches to 10 inches drain and sewer lines. The K-1500SP has additional power to clean the larger size sewer lines. The K-1500Sp offers a one horsepower Totally Enclosed Fan Cooled Motor. This one of a kind sectional machines that is fast acting machine. The K-1500SP offers an easy to release cable and it has a no overrun to the loop and it won’t damage the cable. The RIDGID K-1500SP offers a low profile frame that was created to fit most crawlspaces. There is a 10″ semi pneumatic ball wearing wheels making transportation a breeze. The clutch jaw on the K-1500SP has a change out that adapts to the K-1500SP to work with 7/8″ cable and it has the capacity to clean 2 drain lines to 4 inch drain and sewer lines. The K-1500SP W/C-11 comes with the K-1500SP Sectional Machine with a Mitt and a Pin Key. It comes with a Rear Guide Hose and Three Cable Carriers. This package comes with a Nine Piece 1-1/4″ Tool Package that includes Augers, Hex Keys, Cutters and Blades. The RIDGID K-1500G is a gasoline-powered engine that works best for cleaning the drain and sewer lines. This machine has the capabilities to cut the roots that are in the way of sewer lines in just seconds. This machine spins cable at a rate of 600 rotations per minute. There is a release that will let go of any cable that gets stuck in seconds. This sectional machine is equipped with a 6 horsepower engine that drives the cable with a 4-speed transmission. The machine has various forward speeds that are 333, 425 and 500 rpms and the reverse speeds are 250 rpms. This machine carries a low profile design that comes with a wheel cart for easy transportation. Anyone of these Sectional Machines from RIDGID are effective and powerful machines. These machines were designed with the toughest clogs in mind. Whether you are a professional or a homeowner, RIDGID tools are made to last. They have a great reputation for long lasting and well-constructed tools. All of their tools are tested for quality and safety. RIDGID Tools has been in business for many years, they service all types of businesses as well as the average homeowners. Next time you are looking to save money, check out RIDGID Tools and all of the tools that they have to offer. Their Sectional Machines are top of the line and they have a great product line as we just outlined for you. Take a look and see which machine works best for you.